I wasn’t sure what to expect from this book. I figured it would be depressing and I couldn’t imagine how a story of people living in the dump was going to be much of a story to tell. Well, I was completely wrong. The story is told from Sang Ly’s perspective and she is quite the storyteller. She is quite witty and had me laughing in the first chapter. She is thoughtful, intelligent, and has a will to improve her life. Sang Ly is a wife, but most importantly a mother. She thinks and feels like any mother in the world, with her focus on her son being healthy. Isn’t that what every mother in the world wants? No matter whether you live in a dump in Cambodia or a mansion in California, all a mother wants is for her child to be happy and healthy. For Sang Ly, it was her sole purpose. Sang Ly devises a plan for a better life and that dream involves her asking for help from someone she least expects to ask for help. The way of life for the people living at the dump and the descriptions of their homes and belongings were shocking to me. The little things that were appreciated, their meager food portions, the constant struggle to survive were heartbreaking….and even more so knowing this truly is happening every day in Cambodia and other places around the world. This story will remind you that possessions are just things and what truly matters in life is happiness, love, family, friends and your health. Sang Ly and her husband Ki remind us that we make our own happiness, not by the things we have, but by spending time with those we love. This story is based on truth and is told about real people. 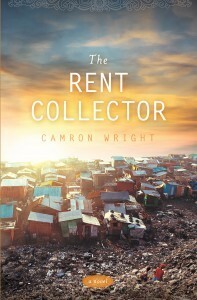 By going to www.TheRentCollectorBook.com you will learn even more about the story of those who live at the dump. I found the photos on the website and at the back of the book, fascinating and wonder how the people in the story are doing now. This story is eye-opening, intellectual, heartbreaking, and inspirational. It makes for an excellent book club discussion and questions are available on the book website. Camron Wright is an author I will be watching for in the future. Camron Wright was born and raised in Salt Lake City, Utah. 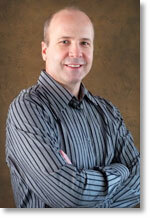 He has a master’s degree in Writing and Public Relations from Westminster College. He has owned several successful retail stores, in addition to working with his wife in the fashion industry, designing for the McCall Pattern Company in New York. He currently works in public relations, marketing and design. Camron began writing to get out of attending MBA School at the time and it proved the better decision. While reading this book, I realized I had one of his books on my to-read shelf, LETTERS FOR EMILY. I look forward to reading this book as well. I read this book for my own enjoyment. This review is my honest opinion. If you choose to purchases this book through the above link, I may receive a small commission without you having to pay a cent more for your purchase. Thanks for supporting SincerelyStacie.com reviews.